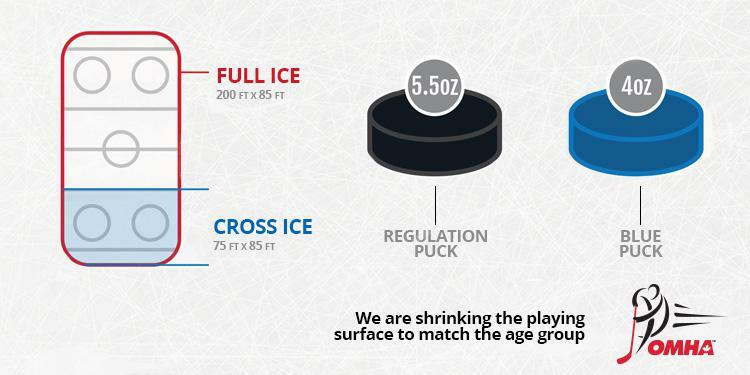 Did you know five and six-year-old players can reach top speed on a cross-ice surface? A study by Hockey Alberta showed that players can reach a top speed of 17.5 km/h with an average distance needed of 65 feet. The strongest skater in the study needed only 60 feet to reach top speed. A cross-ice playing surface measures at 85 feet from board to board, and the distance between a goal line and the nearest blue line is 64 feet. Player’s acceleration rates increased when the playing surface was reduced. The study also indicated that players accelerated faster on a cross-ice surface over using the full ice. The theory was that the players believed they had a better opportunity to get the puck when playing on cross-ice, which resulted in increased acceleration in pursuing the puck. Over the full ice, it was noted that there were fewer puck touches and fewer plays being made. It’s important to understand the difference between top speed and acceleration. In hockey, there are many stops and starts, turns, pivots and changes of pace, which all tie into acceleration throughout a game. It’s rare for a player to be at top speed throughout a game, as the study found NHL players have an approximate top speed of 40 km/h but only spend 20 percent of each game skating above 20 km/h. The average sprint speed in practice was double that of average game speed. In practice, there is a greater opportunity to skate faster for extended periods of time, confirming the importance of the 3:1 practice to game ratio recommended by Hockey Canada. The focus of the Initiation Program is developing individual and team skills by using a smaller ice surface. Players will learn to better control and protect the puck in smaller areas, skate under pressure and become more successful in the long-term instead of chasing an opponent down the ice and not touching the puck. Using the lightweight, age-appropriate blue puck instead of heaver black puck helps in this regard. Players must learn to perfect the skating techniques so bad habits don’t get reinforced down the line. Working with a blue puck puts allows a player to focus on their skating and puck control instead of potentially harming their development by trying to control a heavier puck. The speed in cross-ice hockey isn’t just about how fast a player can move. 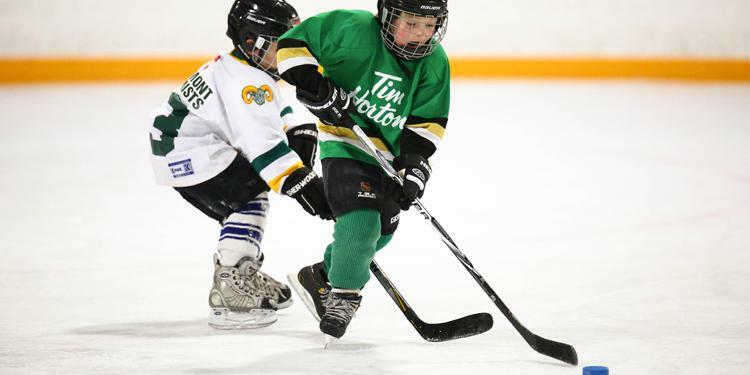 More puck touches, a smaller playing surface and an increased amount of shots and puck battles all speed up the mental learning process for the game’s youngest players. Cross-ice hockey creates a positive learning environment that encourages skill development and gives players confidence while building a passion for hockey. A scaled down ice surface forces players to become more creative with their footwork and puck control. Instead of simply relying on speed or size to get ahead of opponents on a breakaway, players now need to develop decision making ability and use their teammates more to help them in the smaller area.